I’m Charlie Nardozzi and this is the Vermont Garden Journal. I’m not a big fan of gaudy sized and colored flowers, but here’s one I really love. The perennial hibiscus is flowering now throughout our region. Talk about a show stopper. It grows 3 to 6 feet tall and produces whomping 8 to 12 inch diameter flowers until frost. Unlike its tropical cousin, the perennial hibiscus is hardy to zone 4. It emerges late in spring, but hits its stride in mid-summer putting on growth seemingly overnight. By late summer the flowers start to open in colors such as white, pink, red and lavender. The plant dies back to the ground each winter. Since perennial hibiscus is a tall grower and fall bloomer be strategic about where to plant it in your garden. Use perennial hibiscus as a focal point in the back of a flower border or mass them along a wall or house for a dramatic effect. Some good varieties to try include ‘Lord Baltimore’, the diminutive Luna Red, Rose or White, or Kopper King. I like Kopper King because the white flowers have a red center and the deeply cut leaves are tinged with bronze. 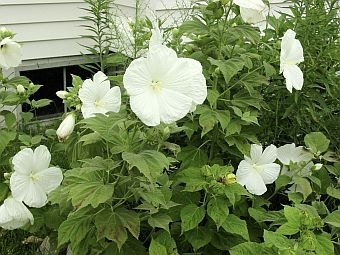 Plant perennial hibiscus in full or part sun on well drained soil. They’re pretty forgiving plants, but do like a good drink during hot, dry summer weather. Amend the soil with compost annually. In very cold areas or for first year plants, consider mulching the roots in late fall with straw or bark mulch to protect them. I’ve noticed that perennial hibiscus like to self sow in my garden. After a few years I see new plants popping up among my perennials. However, they all seem to have red flowers regardless of the variety I’m growing. Now for this week’s tip, do you know when your melons are ripe? Lift cantaloupes off the ground and if the fruit naturally slips off the vine, they’re ready to eat. Check the last tendril or curly curl nearest your watermelon fruit. If it’s dried up, your watermelons are ripe. Next week on (my garden journal) the Vermont Garden Journal, I’ll be talking about sweet potatoes. For now, I’ll be seeing you in the garden! Learn more about The Vermont Garden Journal.